Pattern: Pomatomus Socks designed by Cookie A. for Knitty. Overall, I am relatively happy with these socks. The black yarn is shot through with blue, which is very pretty. As I was knitting, however, the black dye came off on my hands. 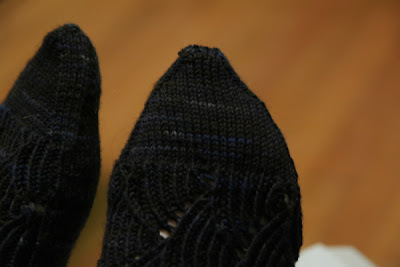 I asked around on Ravelry and a few people swore that once I washed them all the excess dye would be gone and they won't turn my feet black. They are drying right now, so that remains to be seen. I'm not sure how well you can see that. Black is difficult to photograph and your monitor may be darker than mine. If you can't see it, just take my word for it. Fans of Cookie A. and her sock patterns will be happy to know that she has a book called Sock Innovation coming out this April through Interweave Press. If you see it before I do, let me know how it is! Speaking of Interweave, the new issue of Interweave Knits is pretty awesome compared to the last two (though if you can understand why the Petal Halter is so popular, please explain to me. Mysterious!) Anyhow, the projects are great, but I think my favorite part of this issue is a short article called "Start as many new projects as you can." The author, Vicki Square, advocates keeping your creative juices flowing by having a variety of projects going on at one time. This is so simple and so brilliant. For quite a while I've been trying to limit my number of projects in progress, as if casting on above a certain number of projects indicates a weakness or fault on my part. Three is my magic number, though recently I've been down to one or two at a time. My thinking was that I get things done faster that way, and maybe so, but it's not as much fun. This article hit the mark with me, and I realize I'd have a better time if I had a variety of projects going on so there would always be something I'm in the mood for. If I want to work on something complicated, or something to take to knitting group, or if I just want some simple knitting because I'm too tired to think. In that spirit, yesterday I ignored my Marseilles Sweater and my Guacamole Socks and cast on for the Icing Swirl Hat to match my recently finished neckwarmer. What a quick, satisfying project! It's the next day and I'm practically done. Variety is so good. I don't think I've ever had more than one sweater going at a time, but I'm seriously considering casting on for Coraline soon. I keep thinking about it so what better time than now, when I feel inspired and excited by the project? Marseilles will still be there the next time I go looking for it.